Michel Bénébig was born 27th June 1964 in Nouméa, New Calédonia, a small Island of the Western Southern Pacific. Michel discovered the Hammond organ through hours of listening to his parent’s old vinyl recordings. At 7 years of age, Michel was surprised and excited by seeing Rhoda Scott on the télévision. At 11 years old, he played bass guitar, accordion, electronic organ ( Farfisa organ ) and the synthesizer in various orchestras and bands all over New Calédonia. Michel joined the Territorial School of Music of Nouméa, and followed traditional courses of piano. In 1990, Michel headed to Besançon, France, to complete a 2-years degree at the local Academy of Music. It was here that an enthusiastic friend first introduced Michel to the real thing ; the Hammond organ, an L-100 model. Michel knew there and then that Hammond was the instrument for him !. Upon returning to New Calédonia, Michel ordered a Hammond XB5 model, just to get started. Michel became a music teacher at the Territoriale School of Music, the same school he attended as a student, at the same time launching an intensive study of Hammond organists such as ; Jimmy Smith, Jack Mc Duff, Jimmy Mc Griff, Shirley Scott, Rhoda Scott, Wild Bill Davis, Richard “ Groove “ Holmes, Joey Defrancesco, Doctor Lonnie Smith, Charles Earland, and so many others… you get the picture. In February of 1995, fate took a lucky turn, Michel came in contact with “ Keyboard Exchange International “, an American company located in Florida that is dedicated to the restoration and exportation of vintage Hammond Organs. Michel spent a month here carrying out a specialised technical training course with Gary Eddinger ( a highly regarded Hammond specialist ). 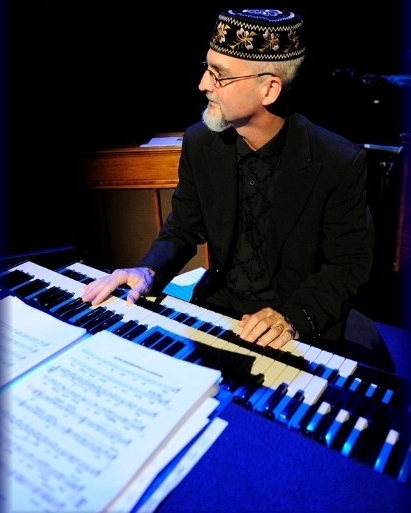 Michel also began recording an instructional vidéo with another organist named Eddy Crocetti from Fort Lauderdale, Florida. This vidéo was sold with organs in order to give young and budding organist a kick start into the world of Hammond… a fairly daunting instrument, as i’m sure you’d know, if you don’t know what you’re doing. Whilst on the trip to Atlanta in Georgia, Michel had the extreme pleasure of meeting the great Jimmy Mc Griff. Michel was helping Joe Vaughn, the owner of the B3 being used for Jimmy Mc Griff’s tour in the small town of Rome. When Jimmy himself asked Michel to play… the whole time Michel was playing a tune from Jimmy Smith, Jimmy Mc Griff remained next to him, tapping along, providing strong encouragement and praising Michel’s footwork ; “ Not bad for the 2 years old Hammond player !!..”. Another pleasurable moment was the meeting with the Master : Jimmy Smith, in Oakland, California at “ Yoshis “ famous Jazz-Club , in 1996 with Pete Fallico. Michel was elected the Organist of the Month of May 2006 by the “ International Archives for the Jazz Organ “ in Germany. Michel is an incredible Hammond player, his fancy footwork always amuzes the audiences, Michel’s smooth style is something you’ll just love.. If you’ve never heard of Michel Bénébig, then maybe it’s time to check out Hammond organists on a global scale. Michel is the finest B3 player to hail from New Calédonia ..